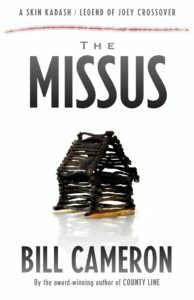 As a thank you for signing up for my newsletter, please enjoy a free copy of my short story “The Missus.” The link below includes the story in three formats, .mobi, .epub, and .pdf, so you may read it on a variety of devices. “The Missus” is a Skin Kadash story, taking place shortly after the events of Chasing Smoke, when Skin returns to work as a homicide detective after his long and eventful medical leave. He expects to spend a quiet time reviewing cold cases and getting back on his feet. Instead, his new lieutenant—and former partner—hands him a hot capital case with explosive implications. The story also introduces Joey Getchie, the main character of Property of the State, book one of The Legend of Joey. The story is told from the point of view of Skin, but it references events of singular importance to Joey Getchie—though they occur five years before Property of the State and Skin’s view of them differs significantly from the fragments Joey remembers. That said, this story could be seen as containing a minor spoiler or two for Property of the State, so if you’re concerned about such things, you might consider reading the book first. “The Missus” also serves as a bridge between my adult mysteries and my new, young adult series.